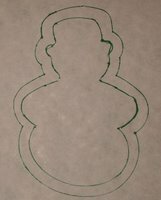 Trace cookie cutter on paper to make template. Trace the inside and out side to see which you like better. Cut out the line that you like best for template. 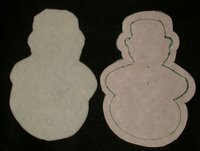 Pin template to fabric; this way you are sure not to leave ink marks on fabric. Embroider both pieces of fabric. Use two or three strands of embroidery floss. See picture under #7. Put wrong sides together place one safety pin in middle to hold while sewing. See picture under #7. 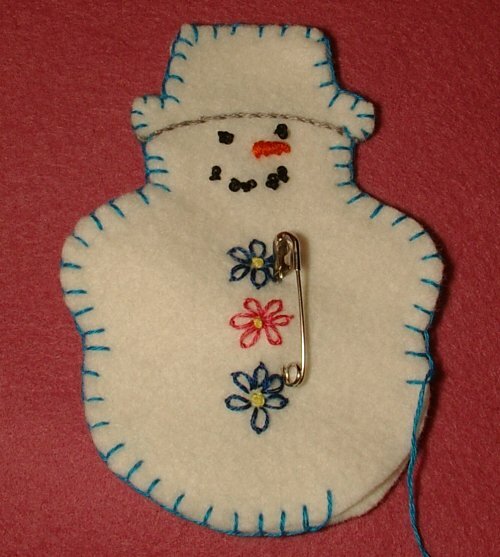 Use a blanket stitch to stitch edges together, stop about one inch from ending remove safety pin and stuff ornament. Finish closing. Finish with a piece of embroidery floss as a hanger. I have made a few others since this tutorial. If you make your own I would like to see them. If you make some send me a link and I will look at them if we get enough I will start a flicker group. I have opened a flicker group to post them all please feel free to join. 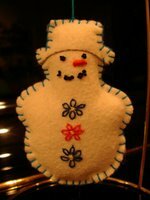 This group is about the fun of making and sharing felt ornaments and other felt items. Please look on the side bar there are many more holiday tutorials listed there. 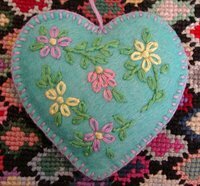 I love those felt decorations, I think I could make them, just not sure how good I would be with that blanket stitch around the edges. They are wonderful and the embroidery is lovely. Thanks for sharing. I love both of these. Thank you so much for the directions! Someday I'll have to share something, to repay all the great ideas I've gotten from other people's tutorials! Your work is beautiful, too. Yes, Nancy Jo, the blanket stitch is very simple, esp since you already seem to be handy with a needle. I taught myself about a month ago right out of a book. You can do it! Well then I must try!!!! What a great idea! They are so cute :-) My children would love to have a go at a few of these! Lovely! You are so sweet to share. These are precious! Thank you so much for the tutorial! I'll be trying these. And you're right--they would make terrific gift tags which can then be used as ornaments! Have you seen the Stitchalong by Kristin Nicholas (http://colorful-stitchery-stitchalong.blogspot.com/)? These ornaments are fantastic. We decorated our tree tonight and I was thinking to myself that we need more felt ornaments. Now I have some inspiration and ideas. Thanks! the snowperson you send for the holiday ornament swap arrived last week sometime. i loved it. so lovely. and i lost the strip of paper you attached with your url so i coudl come see hoe to make one, then i found it via whip up! so thanks very much for such a lovely ornament. and also for sharing your tutorial! i can't wait to make a few of my own. I love your site and also you Flickr group but cannot work out how to sign up and become a member. Please can you email me privately and explain how to sign up (I'm a novice). 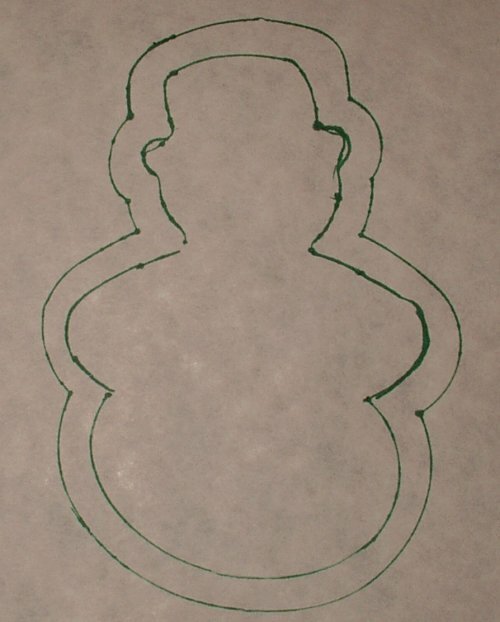 I really like the idea of using cookie cutters as your template. So smart! How sweet! I love the bird ornament best!!! 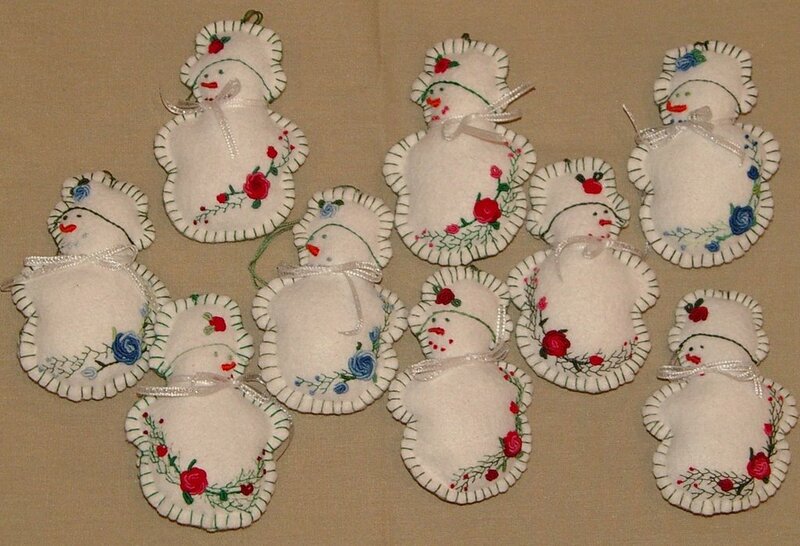 I love the embroidered felt ornament made with the cookie cutters. I absolutely love the embroidered felt ornaments. 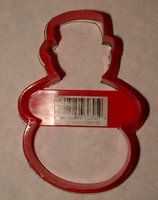 I am so glad I kept my cookie cutters. Thank you for the links. Oooh. 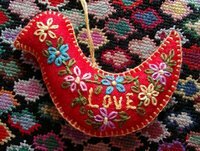 Love the embroidered bird. Very nice selection of ornaments! I love embroidery on wool. The bird is beautiful. 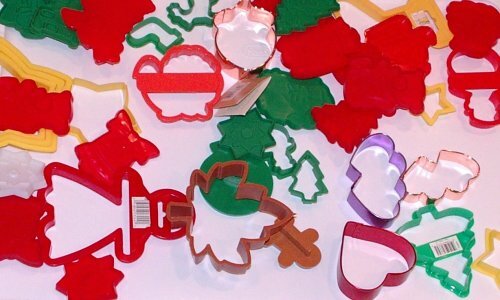 I love the idea of using cookie cutters for ornament shapes. Brilliant! WOW!!! 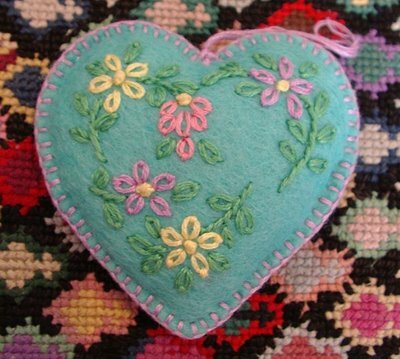 Love them all–especially Sunshine’s Felt Ornaments…check out her Embroidered Felt Heart, too…beautiful! 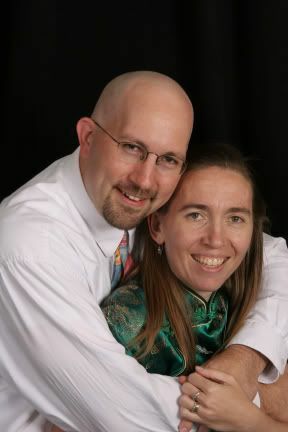 And I love Liesl’s blog…what a talent she is! I put together a bunch of other ornament tutorials on my blog for additional inspiration. I have the whole weekend free—so I’ll be hanging out with my sewing machine! Thanks for all the inspiration—it’s just the kick I needed to get crafty! I like all those small ornaments, but the bird has my preference, and I might well do some. The bird is just darling! I would love to have a bird-laden themed tree–delightful! The bird reminds me of beautiful Swedish folk crafts. Wow! I love all of the ideas you have published so far. I’m in the midst of knitting scarves, but I will definitely have to make time for some of the ideas here. Love the bird ornament!! The breakable ornaments are going to have to stay in their boxes for a while — which would make for a very sad tree this year, except now these are going to be a great way for me to toddler-proof it… last year he could not walk! 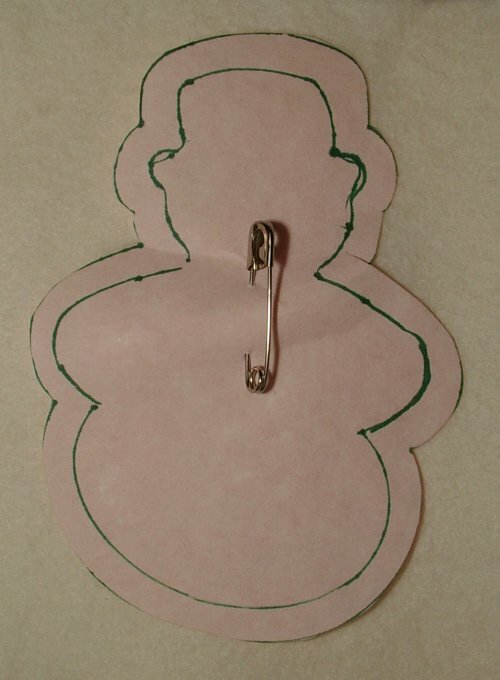 She has a great tutorial for an advent calendar, which fits in with today’s theme perfectly! oh, those birds would make the sweetest package tie ons, too! 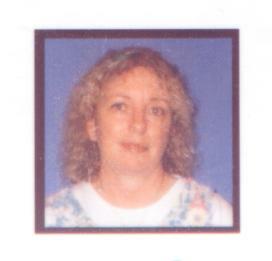 if personalized to the receiver they would then have their own special ornament, also. 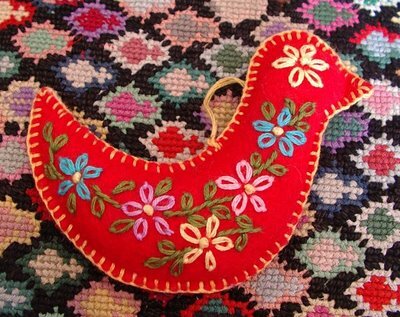 I love the felt ornaments–the bird reminds me of my mom’s (now very old) bird ornaments, made of Chinese silk. I’m going to have to do some of those! I like how the blanket stitching and the thread loop on the felt ornament are both the same thread. thanks so much for all of these great tutorials. I love Sunshines blog, and disdressed. The bird is just what I was looking for to add to my Russian inspired folklore tree this year! The bird ornament reminds me of something we hung on our tree when I was little - I shall have to talk to Mum about it and perhaps surprise her with one I’ve made myself. Great ornaments! I especially love the top one - thanks for the links! Ooh, I’m pretty sure I’m going to “have” to make that adorable bird! That is too darn cute! I adore those bird ornaments! How great would it be to have a tree full of those along with nature items brought in from the outdoors!!! 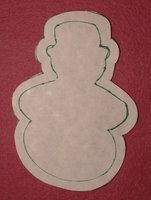 Now I’ve got something to make while the kids are making their ornaments - I started a homemade ornament tree last year, but I don’t want to miss out on all the fun. 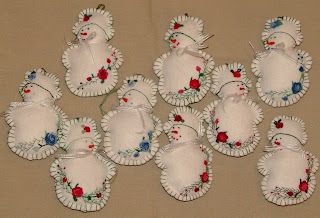 The embroidered ornaments are wonderful- I am going to make some this weekend. I will have a hard time giving them away! The little bird ornament from cookie cutters is super cute! What a great idea for a pattern too. 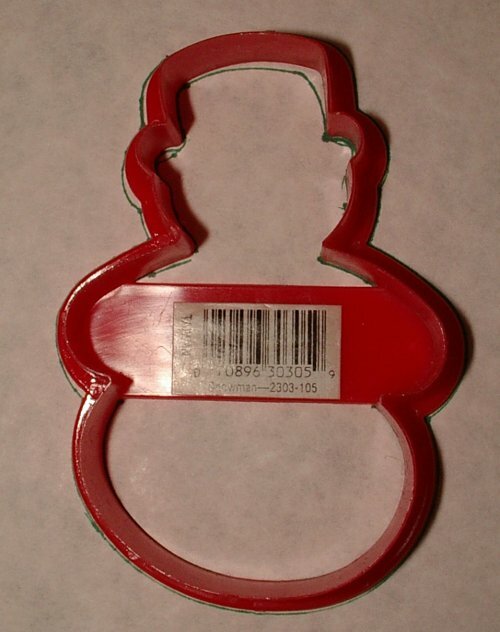 I have collected many unusual cookie cutters over the years and this has got me thinking…A running gingerbread man? A gingerbread man with a heart? A ruffle-y heart? A moose? Oooh, the possiblities are endless. I can’t wait to get started!! Maybe tomorrow….unless y’all distract me again with another great gift idea! Thanks for the tutorial! The ornaments are beautiful and there are so many options. Thanks for sharing. I have been making them to give to my friends and they love it. Oh I love these...my father was Hungarian and we adopted from Hungary a bunch of years ago...these will go perfect with our other Hungarian ornaments...thank you so much! Hope this isn't too stupid a question but is the embroidery decorations on the ornaments just free-handed onto the surface? Love the site and the many tutorials. I just made one, too! I posted a photo on my blog and linked back here.